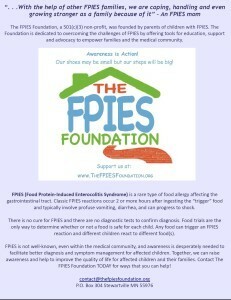 Start The Conversation for FPIES Awareness! Sharon wants to raise awareness for FPIES among her breastfeeding support community. She is successfully nursing her son on an elimination diet and other mothers in her support group seem interested in the changes they have seen in her son since she began her diet. She formatted the “Sample Awareness Letter” to tell her family’s unique story and customized it to speak to the values of her breastfeeding support group. Upon receiving the letter, the breastfeeding support group leader then met with Sharon and they set up a time for Sharon to speak to the other families about FPIES and about how they have learned to cope with and manage their son’s FPIES. She distributed awareness flyers at the support group the week before the conversation was scheduled. At the meeting the following week, she distributed “FPIES at a Glance” and the “FAQ Sampler” when presenting her family’s FPIES experience to the group. Group members received information from her story but also received Medical Advisory Board-approved/written FPIES facts from the supporting documents. Nathan wants to raise awareness for FPIES among the teachers at his daughter’s future preschool. He used the Sample Awareness Letter as a starting point for a conversation with the preschool’s director, at which he inquired about scheduling a time to speak with the school’s staff at a staff meeting about FPIES and how to help the school environment/activities to be safe for his daughter. The director agreed to have Nathan speak to teachers at the next staff meeting. She also requested that he provide some educational documents in advance, so the teachers could read them and be prepared with any necessary questions at the meeting. Nathan provided copies of the “FPIES at a Glance” and “Q&A Sampler” to the director, who distributed them to teachers. He also gave the director some Awareness flyers; the director then distributed the flyers with the meeting agenda for that staff meeting. At the staff meeting, teachers were already aware of FPIES and better able to ask pertinent questions about how they could best help Nathan’s daughter to be successful within the schools activities and curriculum. Because the teachers were already prepared, some problem solving about potential risk factors could actually be discussed at the meeting, rather than waiting for parent teacher conferences to begin. Matilda wants to help her son’s pediatrician and the doctor’s office staff to have a better understanding of FPIES. Some staff members have expressed confusion about the diagnosis in the past and a desire to learn more about what this diagnosis entails. At her son’s well-child visit, Matilda discussed the potential of speaking with the office staff about FPIES and providing educational materials for staff members to keep on hand, to help lessen staff confusion. She used the Sample Awareness Letter as a starting point for this conversation and brought along the educational materials for the pediatrician to review. The pediatrician thought that this was a wonderful idea and scheduled a time slot for Matilda to speak to the staff at the end of the next scheduled staff meeting. At the meeting, Matilda distributed packets to each of the staff members– each packet contained an awareness flyer, a copy of her son’s FPIES story, and educational resources (“FPIES at a Glance” and “Q&A Sampler”). She also included a list of applicable links from The FPIES Foundation’s website, as well as a copy of the most recent medical journal article offering an overview of FPIES. She found the article by searching on The Foundation’s medical journal article page. At future doctor’s appointments, Matilda felt that the staff had a better understanding of FPIES and how it applied to her son’s care. She felt strongly that it improved his quality of care and hoped that it also alerted the medical staff to signs and symptoms of FPIES that they may see in future patients. These examples are just a start— there are opportunities for raising awareness all around us. By taking these opportunities to raise awareness, we are not only helping to find support for our own families but also we are helping to increase the potential for support for future families. Our road with FPIES does not have to end at our front doors— let’s reach out and start spreading awareness today! To download copies of awareness flyers, FPIES At a Glance, Sample Q&A and other tools to print and share, or more information, please visit our Start the Conversation webpage; or contact us at contact@thefpiesfoundation.org for any assistance you may need! We are happy to help you get started!